A lack of jobs, skyrocketing gas prices and escalating food prices and health care costs have an increasing number of Wisconsin residents struggling to put food on their tables. Because one in eight Wisconsin households have been deemed "food insecure," the need for food is growing greater for many families in the Dairy State. As a result, food banks across the state are scrambling to help. Innovative ideas like Field to Foodbank are valuable to helping food banks meet the increasing needs for food. 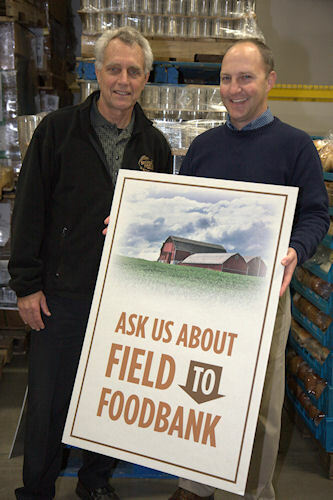 COOPERATIVE EFFORT: Jim Scheuerman , left, of Second Harvest Food Bank of Southern Wisconsin and Jed Colquhoun of UW-Madison director of the Wisconsin Institute for Sustainable Agriculture, started Field to Foodbank in 2010. "The idea for Field to Foodbank was conceived during a processing crops conference, sponsored by the Midwest Food Processors Association, at the lunch table actually, which is where a lot of good ideas come from," explains Jed Colquhoun, University of Wisconsin-Madison associate professor in the Department of Horticulture and director of the Wisconsin Institute for Sustainable Agriculture. "Jim Scheuerman of Second Harvest Food Bank of Southern Wisconsin, myself and a Wisconsin vegetable grower were talking about one particular field of carrots the grower had that was running high yields," Colquhoun recalls. "The grower said not all the carrots could be used because the processing plant couldn't handle them all. Jim asked 'what would it take to process the overage,' and that's when the idea for Field to Foodbank was born." "In 2010, we did a lot of talking," he says. "In 2011, we decided to take a test drive of the logistics of harvesting a large volume. We processed two acres of carrots." A transportation logistics company volunteered to do the trucking, a vegetable grower volunteered the crop and harvested it for us and a processor processed the crop for us and moved it through the food bank system. "We learned a lot in 2011," Colquhoun says. The growers and the processors have always been very generous to the food banks, Colquhoun says. "This is building on top of that generosity. Now we know we have to look across the ag industry to harvest extra vegetables. Maybe someone has a couple extra acres of vegetables available. And someone else doesn't have harvesting equipment available, but they have a couple extra trucks available that day. Another grower may be able to harvest the crop and a processing plant may have a couple hours of time available to process. That's how it works." In 2011, Field to Foodbank harvested snap beans, sweet corn, carrots, onions and potatoes. "We captured 350,000 pounds of vegetables that were harvested and moved to the Second Harvest Food Bank of Southern Wisconsin. And from the food bank it was distributed to food pantries across the state. The important part of that is that a lot of the food went back to rural Wisconsin – back to the agricultural communities that supported the project to begin with." Because they are getting more growers and food processors involved, in 2012 Colquhoun says the goal set is to harvest 1.2 million pounds of fresh and processed vegetables. "I think it's a tremendous opportunity for everyone involved. I have been amazed how fast the vegetable growers and the processors got on board," Colquhoun says. "It tells a great story about agriculture. It emphasizes our diversity and sustainability in rural Wisconsin and reconnects people with food." Vegetable growers interested in getting involved in Field to Foodbank may call Jim Scheuerman at 608-216-7221.